I was inspired to make this Olaf craft when I saw this post here: Cardboard tube Olaf craft. To be honest I didn't read how it was made but was inspired by the photo I saw on Facebook linked to this post. So you can click on the link or read on to see how we made ours. Small buttons, we used blue this time but only because we struggled to find some black ones. Paint the whole of the outside of the toilet tube in white paint. TIP: we left ours to dry before doing STEP TWO. Draw on two eye brows near the top of the toilet roll and a smile about 2-3cm underneath. To make the nose I got a strip of orange tissue paper and scrunched it up. 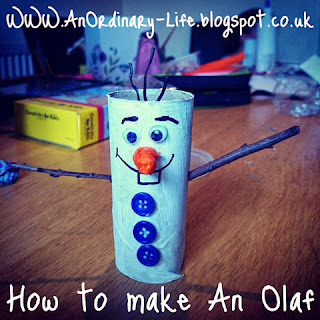 I spread PVA glue over it and shaped it until it looked something like Olaf's nose! TIP: It can get very messy so it might be handy to have some wipes close to hand. With your scissors, push a small hole through your tube in the place you want one of your arms to be and then repeat the other side, in preparation for your other arm. It is important that the hole is smaller than the thickness of the twig to ensure it fixes firmly in place. Push a twig into one of the hole made in STEP FOUR and then the other twig into the other hole. You have made the arms! Stick the eyes on just under each eye brow, the nose just above the mouth and 3 buttons down the front. Cut three short pieces of the twist tie, one about 3cm long the other about 2. Using sticky tape stick it to the inside of your tube so it looks like hair. You are done. I hope you enjoy making yours as much as we did making ours.